A REAL lasting impact, for future fundraising - Jamie McDonald: AdventureMan, Author, Speaker. Superhero Foundation. Every fundraiser dreams of creating a lasting impact. For the causes we support and for the people we hope to inspire. When I started to fundraise through my adventures, I thought any and all money I raised would be donated during them – and, I cheekily hoped, perhaps a bit afterwards, too. One thing I didn’t expect was people to rally around; to help my fundraising with their own efforts. Especially throughout my run, as most of you know, I received messages of bake sales, school ‘Superhero’ fundraising days, people taking on their own adventures and more, all contributing towards the quarter of a million pounds we raised for sick kids in the UK and Canada. Well, recently, I received a message that takes that a step further, still. Soldiers from BATUS (British Army Training Unit Suffield), based in Canada, sent me the following and it just blew my mind. The soldier’s name who sent the message is Chris ‘Ginge’ Dickenson (just to clarify – he called himself that – not me!) to explain that they have created an annual event that looks set to contribute a great deal and have a REAL lasting impact. I’m incredibly humbled by Chris’ words, his passion, how brilliantly Canadian it is and… to be honest, I’m going to stop banging on now and just let him take over…!!! Thank you, to everybody who made this happen, now and in the future. 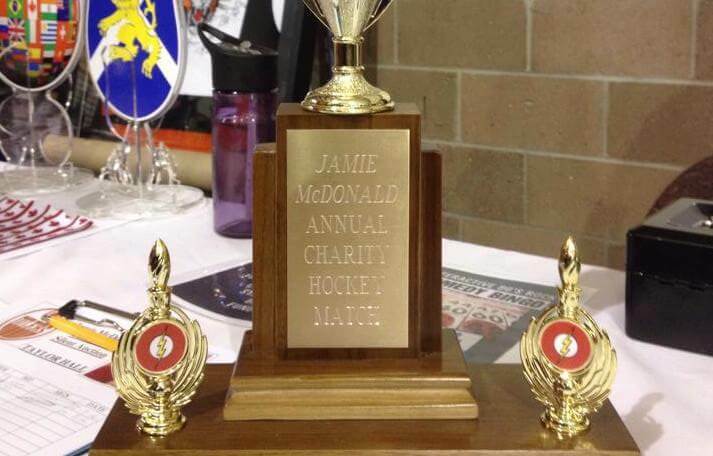 A while back we arranged a hockey tournament on the 22nd of March, raising money for the Alberta Children’s Hospital Foundation, with four teams playing it out for the ‘Jamie McDonald Annual Charity Hockey Match’ trophy. We even had England Vs Scotland – it was epic. Everyone in the Raiston community, local City of Medicine and some key people from BATUS, Andy Keohane, David Thomson, Kev Delves, Mike Robb, Craig ‘flames’ Lochrie, which has shown so much support and helped make this possible. We even had a local ice hockey jersey signed and framed, a raffle, and a local entertainment business called banger bingo, donating their time for free to help bring in the donations. 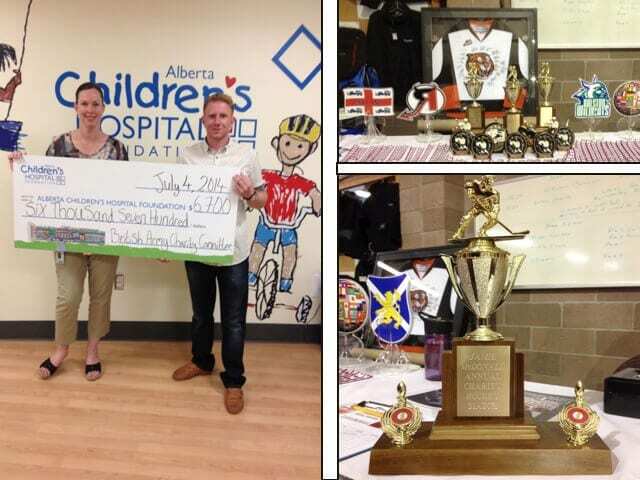 All together we raised $6,700, so on the 4th of July, I made my way to the hospital where I presented them with a big cheque. Honestly, this hospital is unlike any I have ever seen. It is totally dedicated to children and even the design of the building is based of children’s drawings. For us, this will be a yearly fundraising event and it’s all in the name of ‘Jamie McDonald’. Your name is on the trophy, and every year this will be played for to help raise money for your chosen charity.